3-room apartment B4+2, for 6 people, 46 m2, cosy furnishings.Living/dining room with satellite TV and dining-table. Smoking not allowed. Internet (Wireless LAN [WLAN]). 1 sofa bed.Sleeping room with 1 double bed. Sleeping room with 1 double bed.Kitchen-/living room with 4 hot plates, micro wave, oven, dining table, dishwasher, fridge and deep freezer.Shower/WC.Balcony 20 m2, terrace furniture.Other equipment: safe, children's high chair. 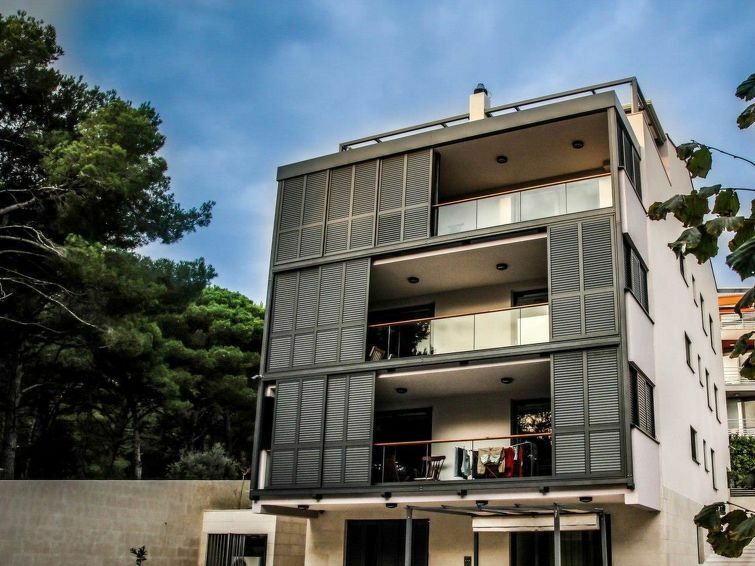 New, beautiful, simple apartment house Marin B4+2, built in 2014 from the 21st century, surrounded by trees.House Equipment: air conditioning.Access & Parking: private parking. All-season motor access to the house. Natural street. Situation: in the centre of Pula, sunny position in a residential area, by the sea. View from the apartment of the sea, the garden and the forest.Surroundings of the house: grounds (shared use), park (shared use), garden (shared use), lawn (shared use).Facilities and distances: shop 500 m, grocers 500 m, supermarket 1 km, restaurant 200 m, indoor swimming pool 500 m, swimming pool 500 m, bathing bay 150 m, pebble beach 150 m, rocky beach 1.5 km, sports centre 1.1 km, golf course 12 km, tennis 1.1 km, tennis club 1.1 km, riding stables 22 km, bus stop 500 m. Please note, nearby is an ein airport/airfield in 12 km.